The work to be done in the PHUSICOS project period of 48 months is divided into 8 Work packages (WP). The work plan and project structure including all WPs, (DS = demonstrator site; CC = concept case) is shown in the figure below. The different WPs are briefly described below. WP1 will ensure a sound and efficient co-ordination and management and collaboration and synergy between all work packages. It is devoted to the coordination and management of the project in such a way that efficient collaboration and communication among partners within the consortium and with parties outside the consortium is achieved; project objectives are fulfilled on time and within budget; high quality standards are met; and the expected impact is achieved. The management of the project includes frequent communications with the Project Officer from the Commission, in order project advancement and minimising the risk of deviations. WP2 is devoted to implementing nature-based solutions at three large-scale demonstrator sites and two supporting concept cases with the overall objective to demonstrate viability and up-scalability of nature-inspired solutions for reducing the risk of extreme weather events in rural mountain landscapes. The case study sites comprise three large-scale demonstrator sites and two supporting concept cases. Together, they represent a broad range of stages with regard to the implementation of NBSs with the demonstrator sites currently in the planning and implementation of risk mitigation measures in 2018. Since the case studies form the backbone of PHUSICOS, over 45% of the PHUSICOS budget is dedicated to the implementation of NBSs at the case study sites. This work package describes the process and procedures for choosing the NBSs to be implemented. WP3 will engage a diverse range of stakeholders through a Living Labs inspired by service innovation at the case study sites (WP2). The Living Labs (LL) approach is a participatory methodology in which four of the PHUSICOS partners have substantial experience (TUM, IIASA, ETHZ and NGI). The LL methodology has emerged in recent years as a form of experimental and potentially inclusive mode of planning (for further explanation, see Part B). Although the scope and character can vary in accordance to the issue at hand, the institutional level and the scope of the problem, the general idea is to involve a range of committed stakeholders in a real-life ‘laboratory’ setting to test and develop alternative solutions for complex challenges. Thus, the approach is about experimenting (learning-by-doing) in order to find ways in which NBSs work in terms of territorial cohesion. A critical reflection of Living Labs brought forth in previous projects has identified challenges related to transparency, legitimacy, durability and equality between researchers and practitioners for co-designing procedures. One way of dealing with these potential challenges is to ensure that the Living Labs are conducted accomplishing other national, regional and local governance processes and ensuring that the general public is involved in or informed of the Living Labs at the very least. For this purpose, the case study sites can draw on the experience of the PHUSICOS partners or engage a local facilitator for being responsible for setting up and steering the Living Labs at the demonstrator sites and concept cases will be established and supported in WP3. providing solid evidence for comparing and integrating them with the traditional grey engineered solutions and other risk reduction measures, also considering residual risk. WP5 will explore policy framework financial instruments to enhance the effectiveness of the design and implementation of NBS in the context of governance innovation. This will include an analysis of EU policy for enabling NBS as implemented by national, regional and local governments, and also instruments and initiatives on the part of the business community and non-governmental organizations. WP6 will facilitate closer collaboration between stakeholders using learning arena innovation to encourage knowledge exchange through the identification of possible NBSs, co-development of scenarios and modelling their impacts at the demonstrator sites, as well as training programmes for key stakeholder groups: decision-makers, technical specialists including local contractors as well as citizens. collaboration between private-public actors to operate the NBS. WP7 aims to establish a comprehensive state-of-the-art evidence-base and data platform concerning NBSs related to extreme hydro-meteorological events in rural mountain landscapes. The established platform will be provided as a service product for the market. This activity builds on the process for establishing an evidence-base as recommended by the Expert Group for NBSs. The overall ambition within WP8 is to design and implement strategic communication in order to demonstrate how PHUSICOS can provide adequate proof-of-concept for the ability of NBSs to address hydrometeorological events in sensitive rural and mountainous regions. 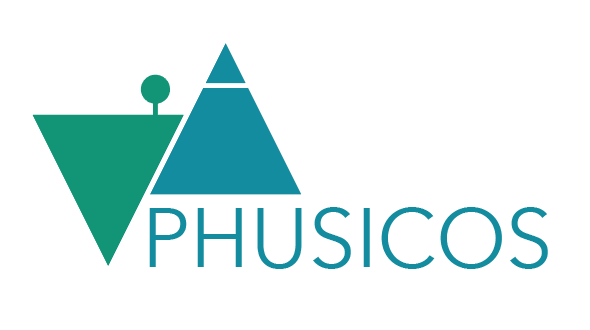 PHUSICOS will disseminate the project’s activities and outputs to a wide audience through a variety of communication channels, including a project website, stakeholder workshops, and multiplier seminars. 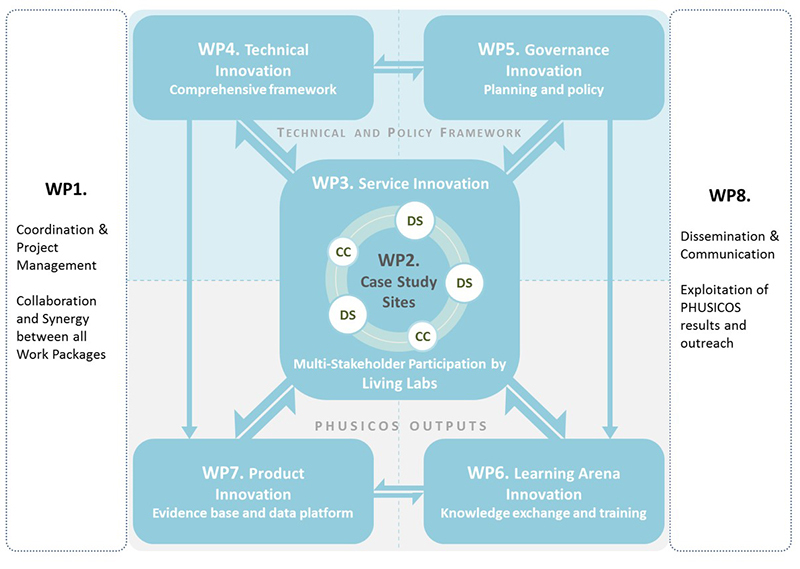 Furthermore, the dissemination of PHUSICOS project outputs to specifically include training programmes (WP6) and the evidence base data platform (WP7) as well as tools and best practices for NBSs will generate market demand and up-scaling towards future implementation and sustainability.